When it comes to nursing, the Rush name means quality. Our national rankings for nursing education and our three-time Magnet-designated nursing staff speak for themselves. Rush University College of Nursing prepares its students to lead, from delivering care at the bedside, to advising about health care policy, to leading health systems across the country. Your support is what makes this kind of forward-thinking nursing education possible. 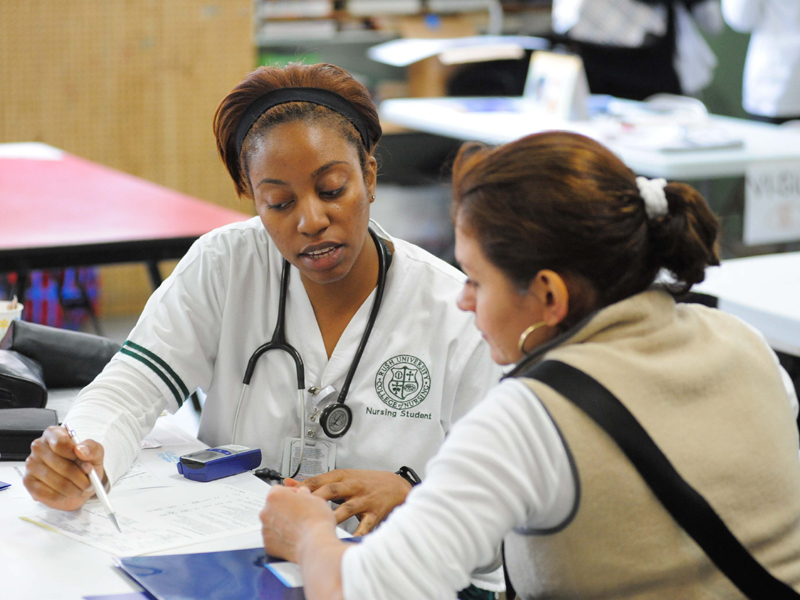 The rising cost of higher education poses a significant challenge to our nursing students. Our Generalist Entry Master’s Program students alone graduate with an average of $60,000 in debt, in addition to any loans they amassed from their undergraduate institution. Without the support of our alumni and friends, the burden of debt for all of our students would be so much higher. We can still do more to reduce it. Your gift to the Nursing Scholarship Fund gives tomorrow’s nurses all the benefits that only a Rush education can provide: hands-on training, the chance to learn from our highly skilled clinical nurse leaders, experience working with diverse patient populations in our community and more. With your participation, the most promising future nurses can pursue these opportunities, regardless of their financial means. Because of you, I was able to experience Rush beyond the walls of the classroom. During my spring break, I traveled to Peru to offer health care to people who otherwise may not receive it. I would not have been able to afford this opportunity without the generous donations from alumni. Our alumni take great pride in their nursing education and with good reason: Rush-trained nurses are a unique breed, well-equipped to deliver outstanding care and improve the health of their communities. They give back to preserve and enhance the same quality of training that they had. Your annual gift of $300 or more to Rush University College of Nursing and its students will be recognized through membership in the Golden Lamp Society. In addition to Golden Lamp Society recognition, your support of the college through an annual gift of $1,000 or more will be recognized through membership in the Anchor Cross Society. A provision for the College of Nursing in your estate plan qualifies you for membership in the Rush Heritage Society. While nursing scholarships and the Rush-Presbyterian-St. Luke’s Nurses Alumni Association are two of the most meaningful ways to strengthen the college, there are many ways to support Rush. If you have questions about your gift or membership in our giving societies, contact the Office of Alumni Relations at (312) 942-7199 or alumni@rush.edu. Want to learn more about how you can support Rush?